Limited 2 CD + DVD digipack edition, released exclusively in French stores and available to the rest of the world only on Season of Mist's e-shop! 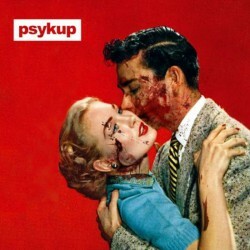 PSYKUP are one of these rare bands that have followed a very personal and highly original approach to metal right from the start. Founded in 1995 the French incorporated influences as diverse as STRAPPING YOUNG LAD, PRIMUS and ALICE IN CHAINS melting them into their own dark, haunted and introspective musical amalgam, that is held together by a clever electric cohesion. Pushing their boundaries ever further PSYKUP expanded the theme of near crazy open-mindedness of their acclaimed debut "Le temps de la reflexion" (2002) into the even more challenging "L'ombre et la proie" (2005). Not content to rest on their laurels, the French abandoned the classical verse/chorus structure on their newest release "We love you all" to make way for a ground-breaking visual and "cinematic" musical pattern reminiscent of story-board-sketches. Their songs now resemble breathtaking short-films directed by masters like John Carpenter, Francis Ford Coppola or Terry Gilliam.